The analysis is performed for individual calculation stages in the frame "Analysis" after pressing the "Analyze" button. During analysis the program attempts to arrive at such a solution that satisfies for given load and boundary conditions the global equilibrium. In most cases this step results into an iterative process. The process of iteration and convergence of the solution is displayed on the screen. The analysis can be stopped any time by pressing the "Interrupt" button. The results are then available for the last converged load increment. The correct results are obtained when 100% of the applied load is reached. Due to convergence failure the program may stop before reaching the desired load level - only a fraction of the total applied load is reached. In such a case it is possible to adjust standard parameters of the analysis setting. When modeling more complex engineering tasks we encourage the user to follow the recommended modeling procedure. The transient flow analysis can be selected in the frame "Settings". The analysis results together with information about the course of analysis appear on the screen immediately after completing the analysis. 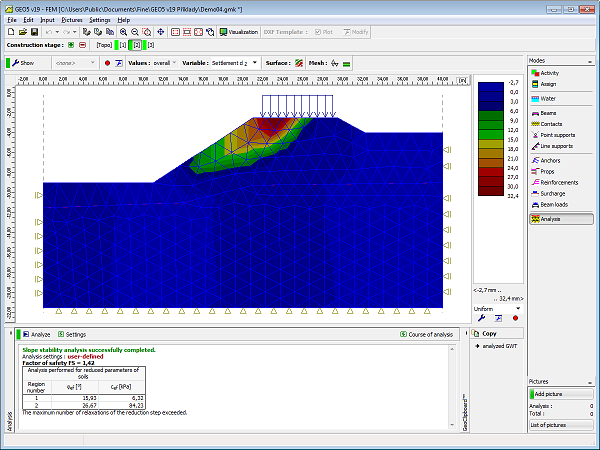 Detailed information about the actual modeling approach is presented in section "Setting and analysis description". Visualization of results can be adjusted in the frame "Drawing Settings". In case of considering water in analysis, in most cases there's a possibility to copy analyzed GWT to GeoClipboard and paste it into another program.